The argument over home birth midwifery played out in the newspapers as well as in the court and the legislature. The Missoulian published this article on January 4, 1989. Although Montana midwives had a long history of working with doctors to serve the needs of women in their communities, their profession—and especially the idea of home birth—faded from mainstream acceptance as the hospital replaced the home as the “normal” birthing location. By the 1950s, a majority of women across the United States delivered their babies in hospitals. Even as hospital births became more common, midwives continued to assume that pregnancy and delivery were nonmedical events. Physicians, on the other hand, began to insist that medical assistance and access to technology were necessary for safe deliveries. 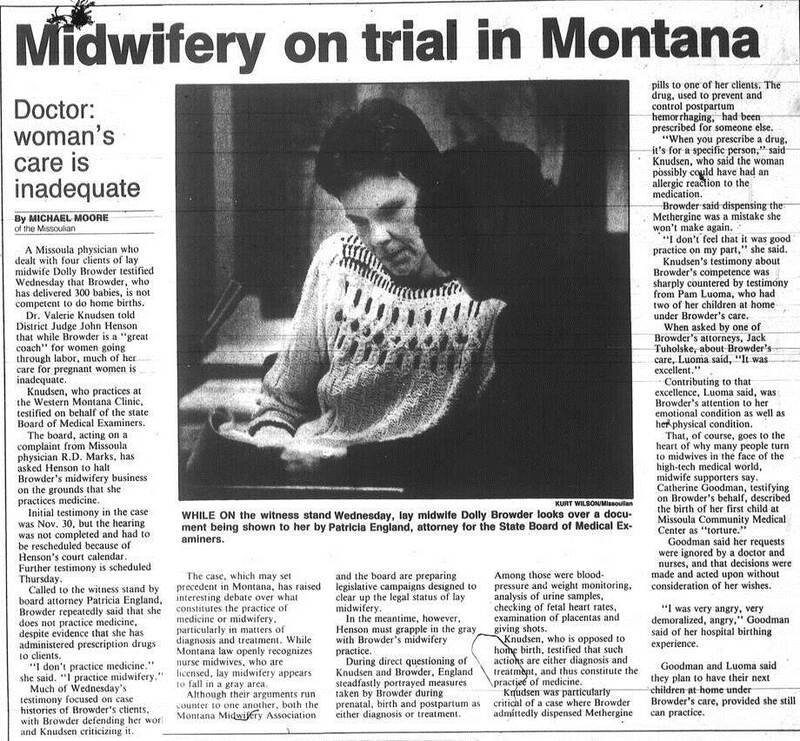 The conflict crystalized in 1988 when the Montana Board of Medical Examiners, at the request of a Missoula physician, pressed charges against a Montana midwife, Dolly Browder, and initiated a court case, accusing her of violating the Medical Practice Act by practicing medicine without a license.